Baltimore is known for being home to several great restaurants, bars and cafes. With plenty of speciality items to try, it might seem like you spend your whole vacation eating! If you are a foodie at heart, and want to experience all that the city has to offer your palate, consider joining up with the Fells Point Food Tour. This walking tour lasts for 3.5 hours, and will allow you to taste all the best rated and most historic foods and drinks in the area. It’s definitely worth an afternoon of your vacation, and best of all, you likely won’t need a lunch or dinner that day, saving you money in the long run! This tour meets in Fells Point at the Broadway Market, and spends 3.5 hours walking and touring the many restaurants and food manufacturers in the area, stopping at 6 different locations for a hearty dish or a sweet taste of something delicious. With each stop consisting of a small meal, you won’t need to eat beforehand, and certainly not afterwards either! Along the way your knowledgeable guide will let you know some history and food facts. You will stop and enjoy foods like sausages from a factory with a 90 year history, Baltimore’s traditional cookie, traditional Polish dishes and crabcakes unlike any other you’ve tasted before. Don’t forget about the stops at the nation’s longest running bar, and Grand Marnier’s only club in America. 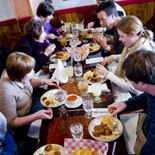 The Fells Point Food Tour operates on Fridays, Saturdays and Sundays only, with the exception of major holidays. The tour leaves at 3, and returns to the same location at 6:30. It is recommended that you arrive a few minutes early to locate the guide before your begin your tour. Purchase Discount Tickets For The Fells Point Food Tour.